the weekend was sunny and productive. a chill in the air prevented us from spending more time outside (although we did get some mulching done), but the natural light streaming through the windows did make for a beautiful day. 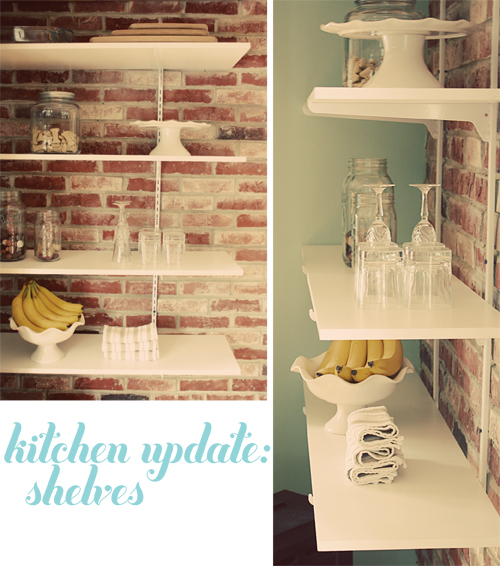 my dad and matt worked together on this project i came up with- kitchen shelves! the problem with our kitchen, although it is quite comfy and practical and i've really no room to complain, is that there is a lack of storage. for now, this is not a problem. we have a few pans and cutting boards and measuring cups to work with, and the cabinet space suits us just fine. post-wedding though, when we will presumably arrive home with an abundance of brown boxes brimming with 'stuff', it may not work so well. i'm all about creativity in such a situation, and have already implemented a few ideas. a rack over the island will house bulky pots and pans, freeing up cabinet space. this kitchen table has worked well so far. not only is it the perfect size, but its lower shelves are wonderful for stashing plastic storage containers (in a wicker basket) and extra dishes. the shelves were my latest thought. i picked up the supplies at home depot a couple of weeks ago, and after being installed this weekend, i am smitten. the simple white works so well against the brick and balmy seas [behr] painted wall. they will be wonderful for extra items that don't fit in our cabinets. for now, i placed a couple of jars with dog treats, loose change and corks, a fruit bowl, clean dish towels, and some fancy glassware. do you have any tips for making the most of storage in a small space? do tell, i could use 'em. my next project? curtains. i will keep you posted.